We've all heard of Pearl Harbor. Usually in the context of WWII history and the bombing that took place there ushering the US into the war and (depending on what textbook you read), giving the Allies the leg up they needed to defeat the Nazis. 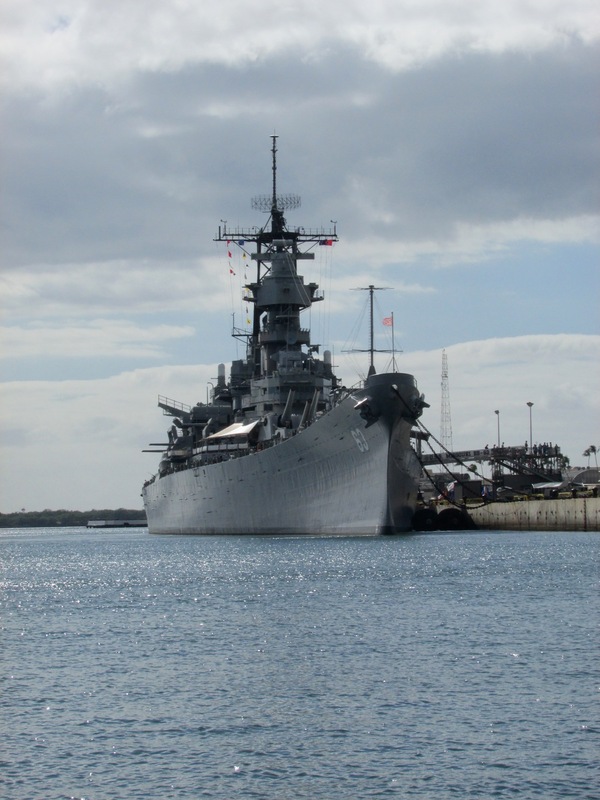 A huge, beautiful natural harbor on the island of Oahu, Hawaii, this was a key position for the Allies in the Pacific arena, and the home of the US Pacific Fleet. On December 7, 1941, more than 350 Japanese planes attacked the harbor, sinking 21 ships, damaging 347 airplanes, and killing 2335 people — 1177 of these people were aboard the U.S.S. Arizona. It's difficult to understand what a sunken, massive military ship really looks like until you are standing on top of it peering into its rusty hull — and you can do just that on a visit to the U.S.S. Arizona Memorial. 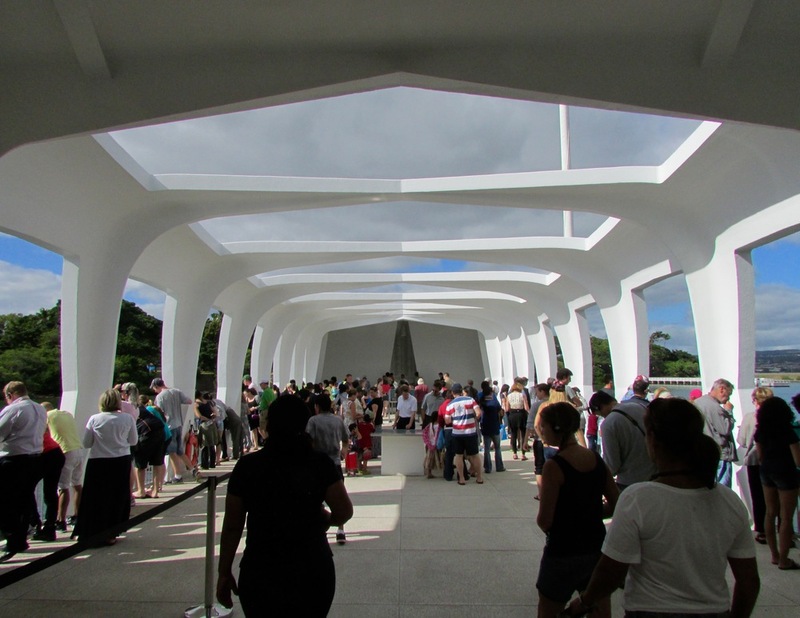 One of Hawaii's most visited tourist attractions, a tour of the memorial begins with a documentary film featuring actual footage of the attack and accounts from witnesses of the bombing. After the film, you will be ushered into a boat that steers you past massive aircraft carriers (above) and other US military ships to the white, 184-foot memorial built in 1962 that sits atop, but doesn't touch, the sunken ship. The memorial contains a wall with the names of the soldiers that died carved into it (below) — the average age of the men aboard was 19 years old. There are a few rusty portions of the ship that sit above the water, and the rest is visible just 8 feet below the surface. Because of the chaos of the attack and the rush to prepare for war, the Navy decided not to recover the bodies and so they lay forever entombed in the hull of the ship, buried at sea. Because it is part of the military base, you can only visit the memorial on a tour. Tours run every 15 minutes and operate on a first-come, first served basis throughout the day. 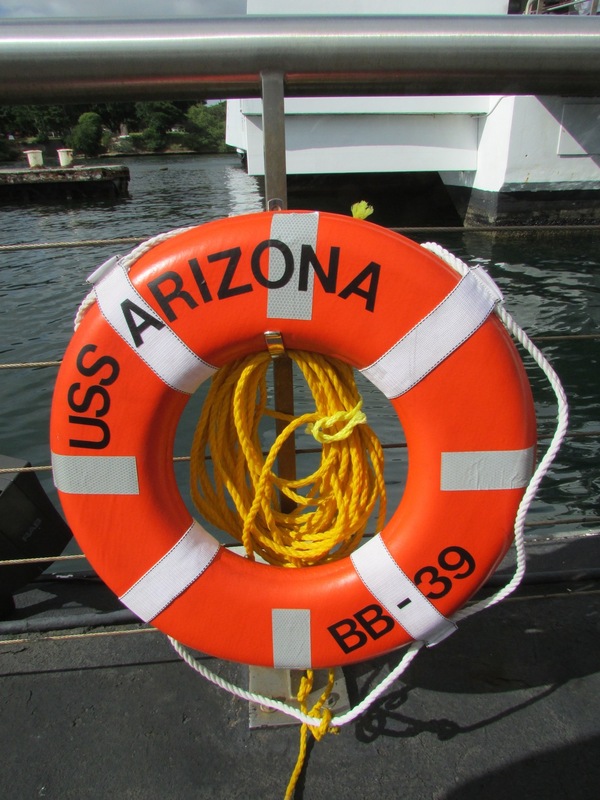 Visit the Pearl Harbor website for more information on tours and spots to visit.